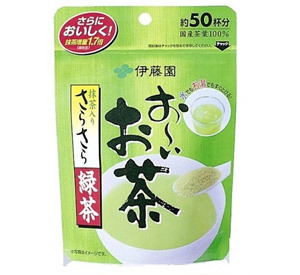 Fine quality Japanese green tea powder is popular in Japan. Just add the powder to water - hot or cold - and simply stir or shake. No special bowl, whisk, or whipping are necessary, and there is no bitter aftertaste. Instant green tea powders are very healthful because you consume 100% of the whole Japanese tea leaf. Made by Itoen, the world's leading purveyor of green teas and beverages. which have to be monitored closely before the tea gets bitter. Very glad to see it here!